The crocodile was in the wrong place at the wrong time when he found himself in the middle of a group of more than 30 giant hippos, resting near each other in the murky water. Having noticed the predator, the animals, known for their aggressive and unpredictable temper, turned hostile. The hippos formed a united front against the croc, with the heavyweights sinking their jaws into the reptile, pushing it away from their territory like bouncers tossing a drunkard out of a bar. The epic scene was recorded by a 71-year-old retired sonographer, Harish Kumar. “This was just an unbelievable sighting,” Kumar told Latest Sightings. “The croc was completely outnumbered and found himself being thrown around and bitten by the hippos. 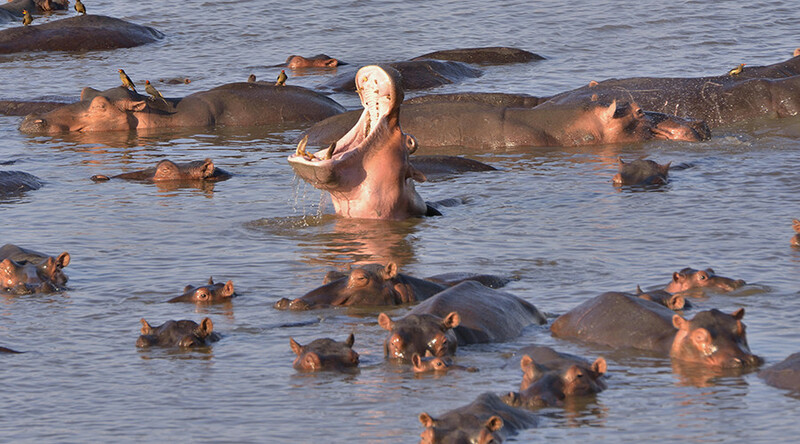 Luckily he managed to get away unharmed.” The moral of the story: don’t mess with angry, angry hippos.